As soon as you step into the lab at Owa Ehan (OE), the enthusiasm is palpable. Members of Miami MedTech (MMT) are eager to share the lifesaving work they’ve been doing, right here on the Modesto A. Maidique Campus. MMT is the first comprehensive healthcare incubator in South Florida that is dedicated to medical device innovation and works to develop products that will make a real impact on people’s lives. As you walk into the lab, you notice the sunlight peering into the modest space, illuminating the team’s kinetic energy and camaraderie. Although the lab is small, the technology they’re developing is big. To the far left is a sink that Yoana Obregon Mendez, the team’s marketing manager, said once held a human heart to test the efficacy of one of their devices. The middle island is the testing station where at any given moment there are half a dozen trials and experiments underway. The team is led by Max Mendez, a medical device engineer and the vice president and co-founder of MMT. 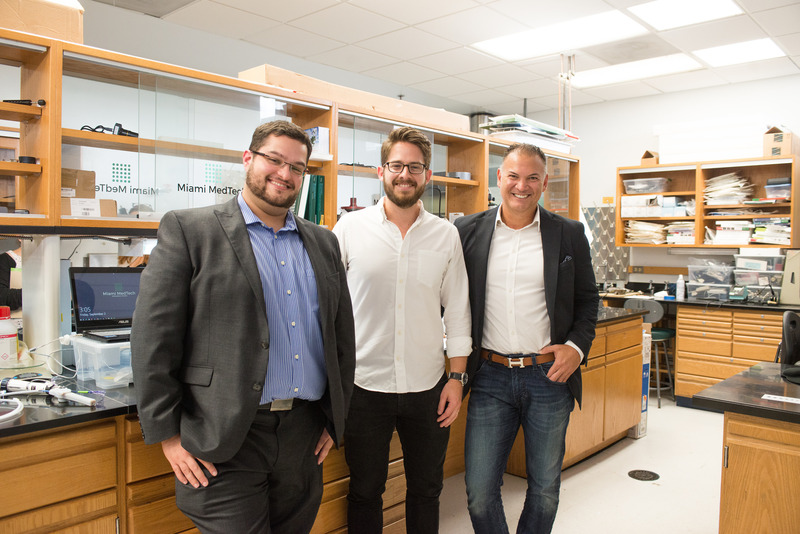 Max, 30, became interested in medical innovation when he participated in a robotics program at Coral Park Senior High School where his mentor owned a medical innovation company. The incubator wouldn’t have been possible without Dr. Pedro Martinez-Clark, a renowned Harvard-trained interventional cardiologist who goes above and beyond the call of duty. Martinez-Clark became involved in medical innovation during his fellowship in Boston and pursued his passion after relocating to South Florida. 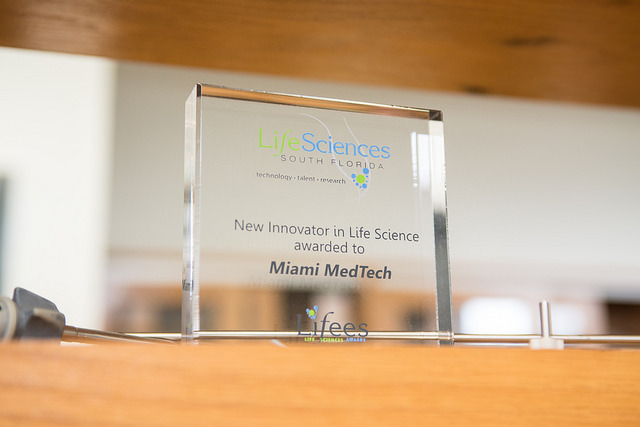 MiamiMedTech was given the New Innovator in Life Science award during the 2014 Lifees. 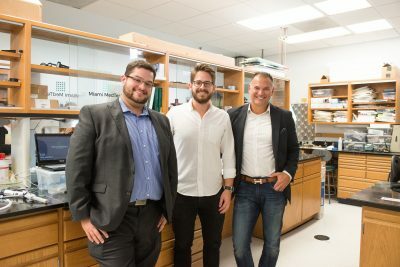 When Martinez-Clark relocated from Boston to Miami in 2007, he struggled to find the right innovation ecosystem in the region, and he continued to work with companies outside Miami until he got an opportunity to work with a group of bright engineers developing a new heart valve that was acquired by a large surgical valve company. Mendez was part of the engineering group; they shared the same vision and a new incubator was born. After co-founding MMT, Martinez-Clark and Mendez began looking for a location that would help them develop the community infrastructure in medical innovation that, up until that point, didn’t exist. 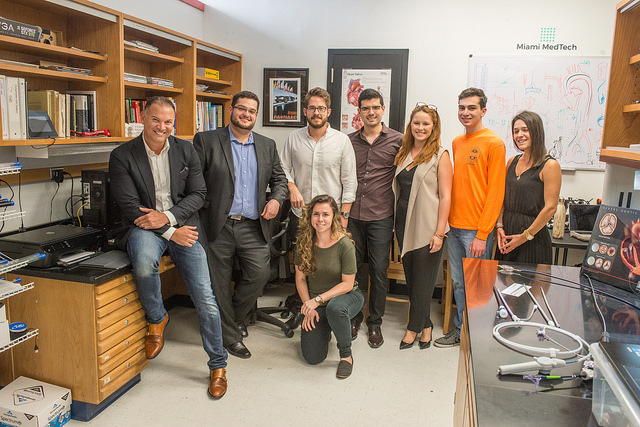 Being on campus provided them the opportunity to participate in the innovation already happening at FIU and gave them access to resources such as faculty and a large talent pool of students. 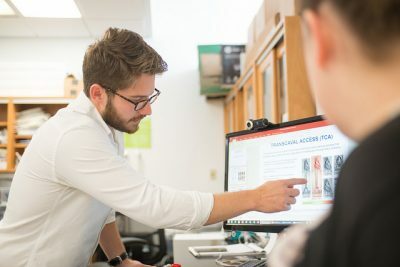 To date, the team has met with countless faculty members and are working alongside local and international doctors to develop their ideas into functional prototypes. Among MMT’s main objectives is to give students the opportunity to learn about medical innovation while working on their projects. Ultimately, they hope to provide technical training in a career field with high earning potential. “The idea is to engage more and more students and capitalize on the local talent,” Martinez-Clark said. Among them is Chris Naranjo, a recent FIU computer science graduate, who has been with MMT all summer. 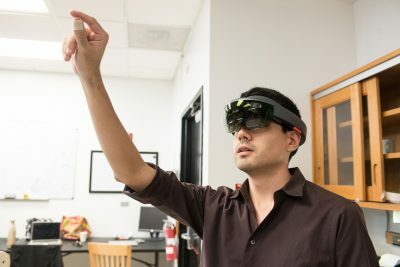 He’s focused on programming a new technology that would use an enhanced reality headset, known as the HoloLens, to allow doctors to see a patient’s medical information with a swipe of a finger during lengthy surgeries. Naranjo is one of four interns (three of whom are FIU students) currently working with MMT on programming and research for potential new products. “I’ve had a lot of fun and learned a lot working here,” Naranjo said. In addition to the HoloLens project, MMT is developing a new technology that would help revolutionize the way heart valves are replaced. Martinez-Clark and his mentor, renowned cardiologist Dr. William O’Neill, developed a new catheter-based procedure and were the first ones to publish it in the medical literature. This new approach is called transcaval access, and it’s an idea that originated in Miami. This technique basically allows patients with small or diseased arteries in the legs to still benefit from percutaneous procedures without the need for surgery. As people live longer, the need for these approaches increases. MMT is creating an implant that would help close the opening and make the procedure much more effective and safe. With patents already filed, they expect to be in large animal testing before the end of the year and clinical trials in the third quarter of 2017. That is MMT’s ultimate goal.